Well, ladies, are you up for the biggest challenge of all now. To win this round you will need a full card! I'm hoping to have the game completed by February 10th because I'll be going in for surgery on February 13th and I want to have time to get the prize ordered before I go to hospital. This has been so much fun and I've thoroughly enjoyed seeing all the great cards, tags, or whatever projects you have made and thank you so much for your enthusiastic participation. What to add to the challenges for this round? Hmmmmm.....how about we just open it up and when you make a card or any other item with rubber stamping on it, share it with us. I think that will work. Now, on to today's numbers. I believe there will be 15 numbers today. Get your brand new, clean cards and your markers......we're off! WOW! That's a great start to Round 5. Good Luck to all. Congratulations to Sarah. She has won Round 4 (H configuration) and will be receiving her $10 Gift Certificate to JessicaLynn Original very soon. 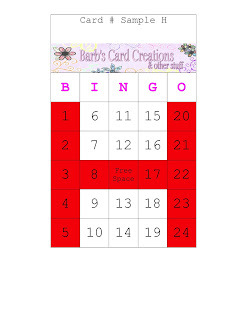 Keep the cards coming because tomorrow starts the final round of BINGO and a full card is required to win! Also, we need lots of cards because I've just had word that my knee surgery has been scheduled for February 13th. That's only two weeks' time! I'm hoping to have BINGO wrapped up by February 10th at the latest, so we will need all the cards we can get. Now I'm going to ask a question: If you were going away for two weeks, you own an XXL Crop In Style bag with wheels, what would you take with you? I'm going to be in a rehab hospital for 2 weeks. Days will be busy with exercises, but nights I will have to myself. I want to play in the evenings so what are the absolute essentials you would take with you? two of my blogging friends. First, Norma of Dittydots tagged me for "You Make My Day". Well, thank you Norma, for such a lovely compliment. I will proudly display the logo right here. Isn't that cute! I'm not sure I actually deserve it, but if Norma thinks so, then I'll just have to accept her compliment gracefully. Now it's my turn to tag some folks. The bloggers who make my day are many. Here is my list of blogger's who "Make My Day". There are so many, many more! Just take a look at my blogroll on the right and pick any one of these talented ladies to visit. You won't be disappointed. Secondly, Shannon of Stamp 'til You Cramp. She tagged me the other day and I'm just getting it done now. Shannon, I'm sorry it took me so long, but here it is now. I'm not going to tag anyone, but I will challenge any and all to complete this excerise. It was fun to do. 1. Settling into a new marriage. 2. Making a space for my daughter to move in with us for a short time, which turned into almost a year. 3. Working as an office manager for EPCOR, in their division office in Mississauga, Ontario. Loved, loved, loved that job. 4. 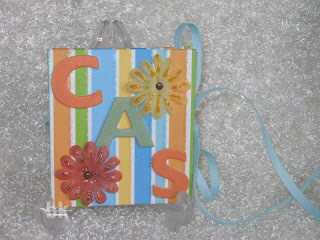 Attended my first Creative Memories scrapbook party. Didn’t think too much of it at the time. How wrong could I be? 5. Selecting new carpeting and colours for the house. 2. Finish up some ATC’s for a swap. 3. Make soup for dinner. 4. 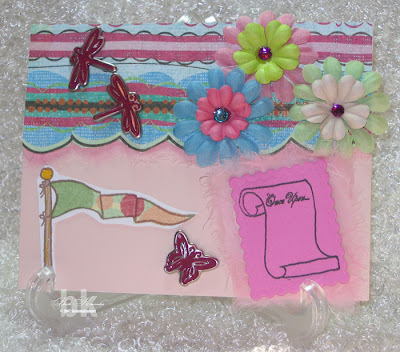 Make a sympathy card. 5. Pick up the mail. It’s – 30 C. here, give me a break! 1. Share my winnings with the kids. 2. 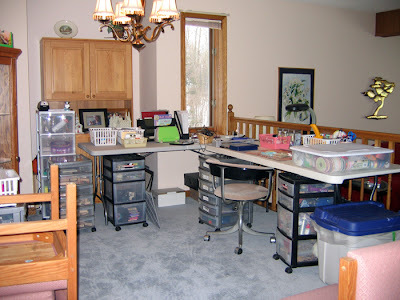 Buy a condo (with my own huge craft room) and all new furnishings. 3. Take a cruise to the South Pacific Islands for 1 month, in a suite with a balcony. 4. Hire a dietician to make all my meals for me for 1 year. 5. Hire someone to organize my craft room, then organize my photos so I just have to scrapbook them. 1. A bikini, but then I never, ever wore a bikini. 2. Pedal pusher style trousers, or some people call them Capri pants. 1. Rubber stamps, all of them. 3. Playing with Photoshop CS3. 2. Gray roots in my hair. 3. My cat, Hank, who thinks he’s the only thing that matters in this world. 4. Chocolate-, potato chip-, cookie-, and candy-manufacturers. 5. Snow and ice on the road when I want to go out. I need to get playing, again! It's now obvious to me that I don't play enough. You know why it's obvious? Well, I'll tell you. I have no card to show you today. That's terrible, they make the posts for blah! 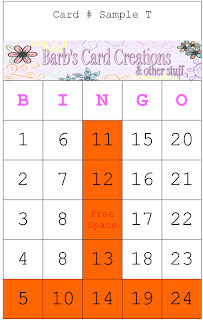 However, I do have BINGO numbers to call, so I'll do that, then I'm going to go create something for tomorrow's post. Today looks like a beautiful day; the sun is shining and glistening off the snow making it look like little diamonds are out there. But, it's deceiving. The temperature is - 28 Celsius and, with the windchill factored in, the temperature is a whopping - 44 Celsius. If you want that in Fahrenheit it's - 18 F, with a windchill of - 47 F. Okay, who can beat that! I've got a couple of Gina K. cards for BINGO today! There were so many numbers for yesterday that I thought these two cards would best be saved for today. 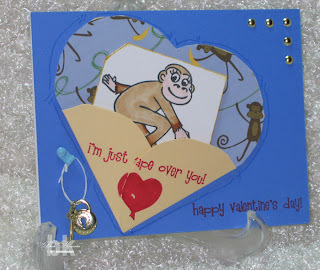 The blue card with the monkey is a Valentine's Day card for my grandson, Owen. It went into the mail yesterday and is currently winging its way to England. It's an unusual colour choice for a Valentine's card, but I just thought blue was better for a boy. The image is from the Just So Hippy! set recently released. The monkey is just one of three animals. There is also a giraffe and an hippo. You can see the sets here. The second card was just for fun. I was actually using the image to practice colouring with my Copic markers and besides, she reminds me of myself. I have a little red car, a Protege5. You remember the Mazda commercials for "Zoom-Zoom". Well, I am "in love" with my car even though it's 5 years old, but I don't care. It makes me feel young and spunky! This is from the 'punny' set, "You Know You're Old When" which is also a recent release. You can see it here, too. Ed. Note: I totally forgot to mention that this card was made for Mojo Monday 22 at Poetic Artistry. I found the sheet I printed off to follow the measurements buried under all the scraps on my desk. Thanks to Julee for all the great sketches. Now, we can get on to the BINGO numbers for today. There were a couple of ladies who commented yesterday that they were close. I wonder what today will bring. Make sure your pencils are sharpened, girls, you're going to wear them down today marking your cards. I really appreciate all of the cards that come in and they're all so lovely. If there are multiple cards, I will put the number in (brackets), but only highlight the site once. Okay, here we go. I think this is a record......we have 24 numbers today!!! WOW! I'm going to save the cards I made for tomorrow. See you then. I just love these images. So much so, in fact, that I ordered a couple today from England! This on-line shopping allows me to shop anywhere, anytime and that's not necessarily a good thing. Oh well, why worry? The button's been pushed and the money's been removed from my account. I might just as well dream about what fun I'm going to have in a couple of weeks. I used my Copic markers for this and tried blending some more. I really need to practice blending and I think I'm getting the hang of it. It really adds depth to the look, don't you think? It's going to be a birthday card for one of my Stamp Shack friends, but I'm not saying who it is. I want it to be a surprise. The idea for a double knot came from Inkin' It Up!, a blog by Kendra Giles. 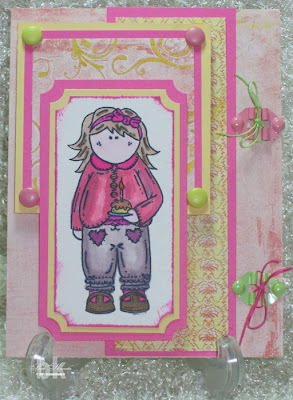 I love her cards and how straight and neat she does her layering. She must have a very special cutter or some sweet secret I need to know! BINGO resumes tomorrow morning and I'm going to have to start the post tonight. I think there will be something like 20 numbers to call, or close to it, at least. Well done, ladies. I'm impressed. See you in the morning. My very dear friend, Sherri, sent me some of these Sugar Nellie images some time ago. I've been wanting to use them and finally got around to it today. 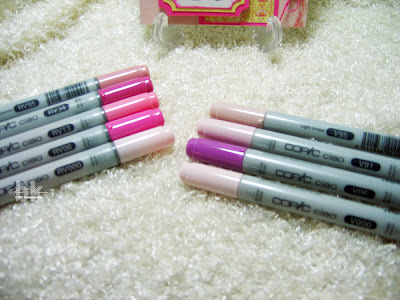 Sherri had asked the question, "if I were to buy only 5 Copic markers, which 5 should I buy?". I answered her with whatever five you buy, keep them in the same colour family so that you can blend with them. Also, don't forget to buy the colourless blender marker as it's so useful. (Unfortunately, I don't have it YET!.) So, here is the card I made and here's a pic of the markers I used. The markers on the right side of the pic are from the Violet (V) family and I used them on the trousers. The colours on the left side of the pic are fromthe Red/Violet (RV) family and they were used on the sweater. I still don't have the blending down to an art yet, but I'm working on it. The blending is much better on the trousers, I think. Well, that's my lesson for today. I gotta run and do some errands. See you tomorrow. Here's another card I did for the January VSN at SCS. This challenge was to use pinks and browns. It's good for an extra number today. I didn't add any further challenges for this round because I forgot. Thanks, Alex, for bringing it to my attention. 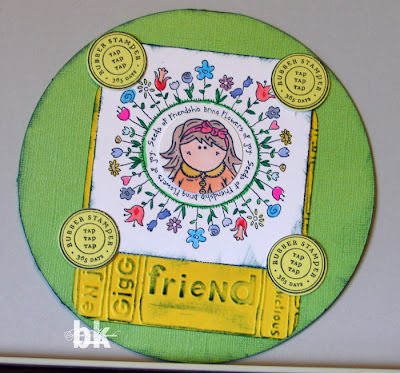 So far we can use Stampin' Up images, Bella images, challenges you participate in from any website or blog and now, let's add any Gina K. Designs. I seem to collect all stamps, from all companies, all the time and I guess I'm hoping to be vindicated by other stampers who spend their money on everybody's stamps. You can use any and all of the above for cards for extra numbers. Now, on to today's call. Okay, that's BINGO for this week. I hope to have lots of cards for you on Monday 'cause this is a tough round and you'll need them. Happy Stamping! When I think of "True Diva", I think glamourous, sparkly, feather and 'all-about-me'. So, when I saw this little lady with just a face in the Yorkie set by JessicaLynn Original, well, this came to mind. I just wanted glitz all over the place to I kept pulling out the embellies that scream "diva" to me. The feathery, black, sparkly yarn, the baubles in pale pink and purples, to say nothing of the glitter paper in the background. I made an oval frame using the CM cutting tools and glammed it up with the baubles, then added the yarn. 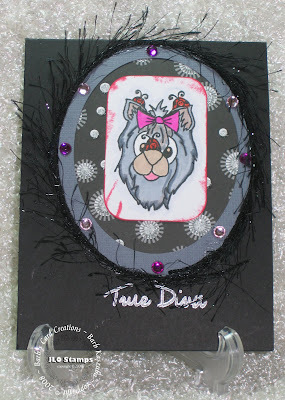 "True Diva" was stamped in silver pigment ink for effect. Okay, that's the sneak peek for today. Don't forget the big JLO release on February 1st. All you ladies with Gift Certificates from winning at Bingo should be ready to shop! You won Round 3 of BINGO by getting the X configuration. It took a lot of numbers, but you did it. Your prize is a $10 Gift Certificate to JessicaLynn Original stamps. Don't forget there is a new release coming on February 1st. Now, on to Round 4. During the summer when we played BINGO, it took forever (it seemed) to get a winner. We must have lots and lots of cards for this round, so get busy ladies! Here is the "H" configuration in pics. This is what you will need to win Round 4. We will start this round with five numbers. Here is another of the cards I made for VSN which I'll put here for an extra number. This card used the Polished Stone technique and I just love the way it turned out. My DH loves it, so he's getting it for his birthday next month! It's looks a little out of focus but I think it's because of the background. The camera probably had a difficult time with the auto-focus. Does this mean I need a fancy-schmancy SLR digital camera. Yes, it does, but I won't be getting one! 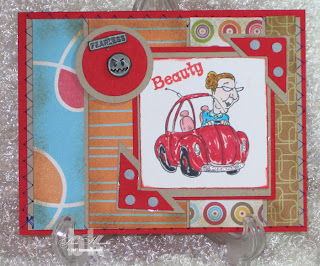 I made this card for Sketch Challenge # 5 over at The Stamp Shack. The Creative Team is doing a terrific job of providing weekly challenges and I enjoy participating in them. 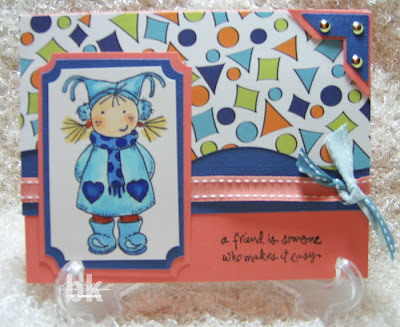 This card uses, what else, but Two Scoops by Basic Grey and the images are from Inkspirations. It's my contribution for an extra number today. I really want to thank you all for contributing such beautiful cards. It adds so much to this game and to my blog. I appreciate your efforts. Okay, mushy stuff is done, let's play Bingo. I chose the single puppy from this JessicaLynn Original Yorkie set for my version of a Kickstand Card. The Almost Amethyst heart is the largest of the heart shapes, then I went down two sizes for the Cool Caribbean heart. Both have been embossed using my Cuttlebug with the Nestabilities shapes and it works wonderfully. 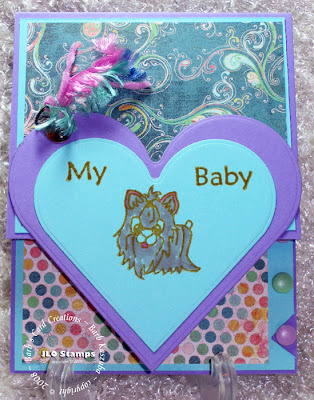 The sentiment, "My Baby", is also from the Yorkie set and I used cello tape covering the word "Baby" and stamped "My". I cleaned the stamp, then cello taped "My" and stamped "Baby" because they are together in the set and I wanted them separated for this particular card. If you are going to use this method, please remember to remove the tape before stamping on your card. I tell you this little tip from personal experience, which is the best of all teachers! The papers are Two Scoops by Basic Grey. Get used to seeing these papers because I am in love with them and I bought two packs because I just had a feeling one pack wasn't going to be enough. 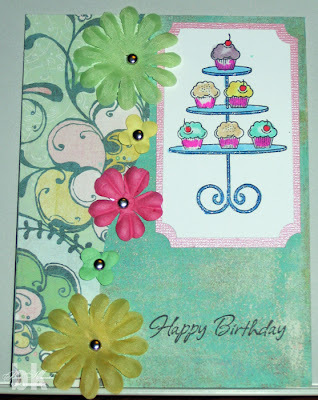 I added some pastel brads on the lower right portion of the card and some knitting yarn on the top for embellishments. I wanted this little lady to stand out on the card. I did learn that colouring with markers on coloured cardstock changes the marker colour. I'll probably not do that again, but, unfortunately, that's how I learn. The good news is that I DO LEARN! Thanks for looking and don't forget the release of the JessicaLynn Original stamps on February 1st. You'll love them. WOW! By my count, there will be 17 Bingo numbers today. That may be enough to have a winner, we'll see. I'd better get started with this because I have a 10 am appointment today and I don't want to be late. Are you ready, here we go. WHEW! You ladies have been busy this weekend. I'm going to save mine for tomorrow. Well, Good Luck, everyone. Come back later today when I'll post another Sneak Peek at the JessicaLynn Original set for the new release on February 1st. 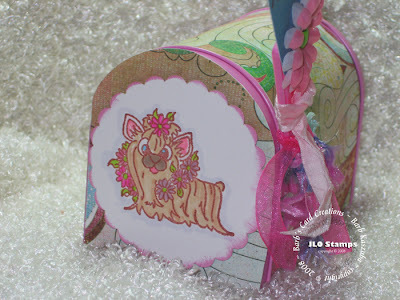 This is the first of the sneak peeks for the JessicaLynn Original stamps that will be released on February 1st. I'm so excited to be a part of this and, starting today, can share with you my creations. I was sent the Yorkie stamp set to play with and I'm having a "doggone" good time. There will be a HUGE launch of 10 new sets, so please bookmark JessicaLynn Original and visit often, particularly on February 1st. There will be special deals to be had and I don't want you to miss out on anything. We don't have Target stores up here in Canada and one of my Shackie friends, Teresa, sent me some of these cute little mailboxes. 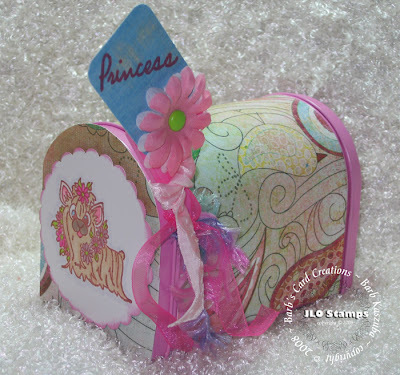 I decided that one of the first things I would do with my JessicaLynn stamps would be to make a mailbox for this Little Princess to receive her own mail. This is a close-up view of the front. I used the gorgeous new paper from Basic Grey called Two Scoops. I love the colours and designs so much I bought two packs. And, they serve this Princess well. This set reminds me so much of my sister's dog. Sassy is not a Yorkie, but she is a Princess and is definitely treated as such. I used my Copic markers for colouring this image. I don't have a dog, only a cat, so maybe the ears shouldn't be quite this pink, but I'm going to see if I can find someone with a Yorkie to study their colours. But, then again, these are fun images and don't necessarily have to be coloured in a realistic manner. Besides, Princesses can do anything they want, right? Check out my fellow-Design Team members Sneak Peeks JLO Design Team Blog. ...for me, anyway! I went to pick up the mail yesterday, as usual, and inside my mailbox were my stamps from JessicaLynn Original. Last night I officially began to make cards as per my Design Team duties. 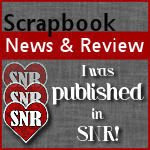 I was so excited and the best news of all, I can begin sharing sneak peeks starting January 21st. So stay tuned to see what I come up with for my first efforts. Now, on to the business at hand of Bingo. Today we will have seven numbers, thanks to all the contributions received. Are you ready? Okay, let's go on with it! Today I'm having coffee with a lady who has had bi-lateral knee replacement surgery. I'm facing that same surgery, probably sometime in February (I'm just waiting to hear from the doctor's office for a specific date). Bi-lateral means both knees are being replaced at the same time. I'm very anxious about this surgery, but I really want to be able to walk again, pain free. Jacqueline tells me I will be really, really pleased once it's all over and done with and the recovery time has passed. Her surgery was June 5th, 2007 and she says she walking just fine now. I'm looking forward to meeting her and asking all sorts of questions. I know it's not going to be easy, but I'm doing it anyway and have mentally prepared myself for the worse pain I've ever felt. Luckily, I have a high pain threshold and I WILL BE BETTER OFF IN THE LONG RUN! I just keep reminding myself that I want to play with my grandsons, take them for walks, bake cookies with them and be a proper grandma to them. I can't do that with these knees, so I'm gettin' new ones. Okay, that's my 'feelin'-sorry-for-myself-time' all used up for today. Thanks for listening. We will have six numbers today. Three of the cards are located at The Stamp Shack gallery and may not be visible to all, however, as a Shack member myself, I can verify that are, indeed, three cards by Cathy in there. Remember, we're going for an "X" in this round. Happy Stamping! Here's my card for an extra number for tomorrow! I did the sketch challenge at SCS today. You can see it here. This set just arrived at my home this morning and it works well with the challenge. The card base was pre-cut with the circle cutout in the upper right corner. I imagine the sailboat is heading out toward the lighthouse and I'm wishing I was on it, BTW! I also used some Chocolate Chip and the DP is Blue Clouds by Design Originals. I added the button brads (which were a nasty piece of work to attach to the card) and used blue embroidery floss. I'm hoping that it gives it an overall nautical feel. 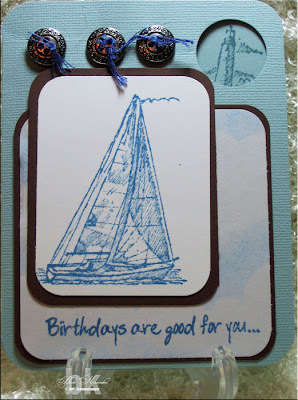 The sentiment is from CTMH's Card Sentiments set. Round Three of BINGO begins today! To the mix of cards eligible for extra numbers, any and all challenges have been added from sketch challenge to colour challenge and they can be from anywhere like SCS, The Stamp Shack or another blog you read. Just remember to let us know where it originated, please. Also, the cards should be current, not ones that you made several months ago. 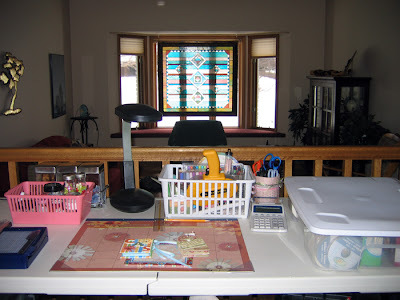 This keeps us crafters busy in our designated spaces. Good Luck for Round 3 and I'll see you tomorrow, if not sooner. I'm having so much fun with this dragon set from Jessica Lynn Original. I think it goes perfectly with Dudley. This is the card that's been rolling around in my head for the last day or two. Finally, this morning, I sat down to make it happen. I'm always surprised when it does because most of the time, it's not like that! Can't you just see Dudley just waiting for find a 'damsel in distress' so he can come to her rescue? After all, I'm sure he's a very gallant dragon. The card base is Rose Red and the DP is from a Self-Addressed stamp kit from many months ago. The purple paper is from CTMH and these little bits were also in my stash of scraps. The colours just make me think 'regal'. I paper-pieced the flag using the same DP red paper. Copic markers were used to colour this image and the shield was stamped three times, once on the main image and then twice more on white cardstock. I then cut them out and used glue dots to mount them over the top of the original to give it a 3-D effect. I'm not sure it photographed well, but looks cool IRL. That's about it for the details and I wanted to share it with you all straight away. You do, indeed, have a Bingo with the bottom row across and middle row down! Way to go. Your prize is a $10 Gift Certificate for JessicaLynn Original. 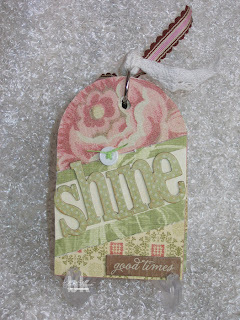 Jessica Lynn is relatively new to the stamping scene and her designs are delightful. There will be a new release on February 1st, so you may want to hang on to the GC until then, or maybe not. I'll order it shortly and you should receive it later today, via e-mail. Ladies, in case you are wondering, any cards you make today will go towards tomorrow's round. 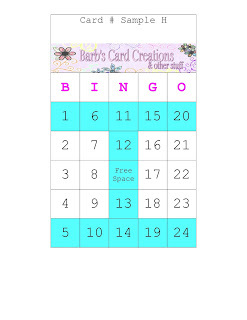 It will be the beginning of Round 3 and, in order to get a Bingo, you will need an X on your card. So, print off a new card and get ready for Round 3. 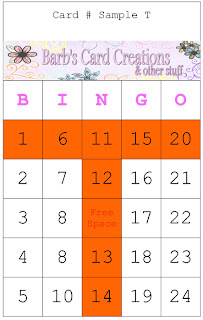 At the moment, you can submit cards made with SU images, cards made with Stamping Bella images and, to this, you can add cards you make for any challenges whether it be from SCS, The Stamp Shack, or any other blog you visit that has a challenge. Please, make sure your card is current and not one that you may have made last year, for example. This way, it keeps up busy crafting which is what we all love to do. I was so busy yesterday, I didn't have time to play, so all you get right now are numbers for Bingo. Then, I'm off to the craft room because I've got an idea running around inside my head that is just crying to come out. Let's get right to it, shall we. Let's see if today is lucky for anyone! WOWSERS! We've got lots of numbers today! I'm a little late posting today because I slept in until 9 am this morning. Very unusual for me, but I needed it as restful sleep eluded me last night. Anyway, here we go with 15 numbers today. This should help lots of people! ** NOTE ** If a card is in the gallery at The Stamp Shack, you will not be able to view it unless you are a member. I'm not suggesting you become a member, just letting you know why it may not display on your screen. I'm a member and love it at The Shack, but it is a personal choice for you to make. Today is going to be busy for me. I've got a chiropractic appointment this morning and this afternoon, I'm driving my DH to his appointment at the MS clinic. This is a place where you "hurry up and wait". That doctor is forever behind in his appointments, but, it's necessary to see him. I'll stop complaining about his poor time management skills now. See you tomorrow and good luck with all these numbers. I've had a great weekend playing with my stamps! I have made five cards so far and want to share them now. The first two use SU images, so they will count towards extra numbers for tomorrow's game. Both also use the Woodland Cottage set which is absolutely gorgeous, in my humble opinion. 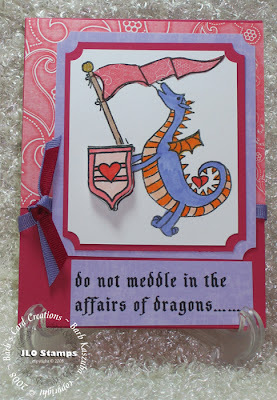 This card was made for a colour challenge at The Stamp Shack. The combination of Chocolate Chip, Peach and Soft Sky is just so gentle and I thought the cottage worked well with these colours. I also used my Cuttlebug for the peach mat and, again, with my Nestabilities. 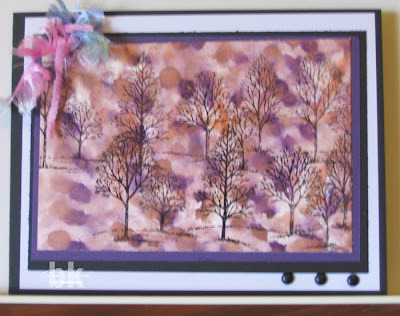 I saw this technique for embossing the rectangle on Nichole Heady's blog and it gives the card such an elegant look, I think. I stamped the image with Ranger's Brushed Corduroy Distrss Ink. Then I added blue brads in the four corners. The sentiment, also from the Woodland Cottage set, was stamped with the same colour distress ink and angled on the corner. And, just to pretty it up some more, I added some Soft Sky double-stitched ribbon. The next card, from the same set, is for a friend whose father passed away recently. The single rose works well for a sympathy card. 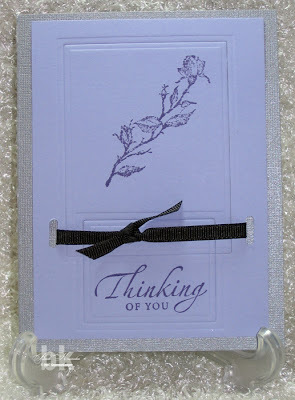 Sympathy cards can be difficult to make, but this set lends itself well for this type of card. The sentiment is from the Sincere Salutations set. The card base is Gray Bazzill Bling onto which I mounted some Almost Amethyst. Before I attached it to the card front, out came the Cuttlebug to emboss it first. I did two rectangles this time, overlapping them. 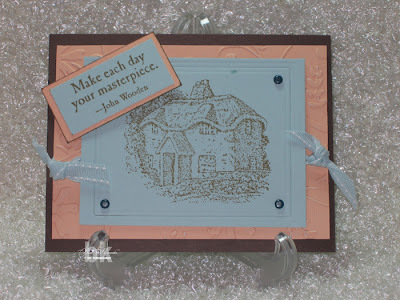 Once the embossing was complete, I stamped the images using Dusty Concord Ranger Distress Ink. I attached some black grosgrain ribbon and decided that it had just the right amount of embellishment for a sympathy card. The next three cards were just for fun. I had to use Dudley the Dragon again because I love him. Not that it matters in a big way, but I created a new watermark to use for the cards I'll be making for Jessica Lynn Original. I went to Chapters (our local book store) and purchased Photoshop CS3 for Dummies. I was determined to learn how to get text in a circle. As you can see (if you look at the watermark), I DID IT! I'm sure I'll be tweaking the design, but hey, I did it and that makes me happy. Now, on to the card! The card base is Mellow Moss and the designer paper is called simply, Toys. Who made it is a mystery to me as it was a small bit in my stash. How do you ladies remember the manufacturer's name for the DP you use? If there's a secret, please let me know. Once the card base was folded in half, I scored it again, 3/4" from the folded edge and then taped it down. I wanted to do some lacing, but, as you can see, it didn't quite work out. That's okay because while I was sleeping, it came to me what I did wrong. You'll have to wait until the next time I try lacing to see if what was in my dream works. I haven't tried it yet but I had better do so soon 'cause I forget my dreams fairly quickly. 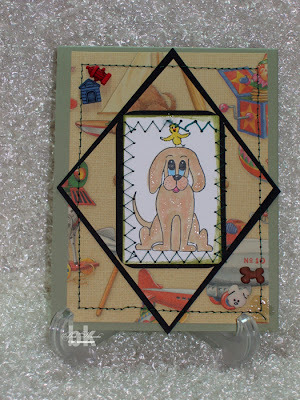 Okay, here we have a stamp from the Carolyn King collection from Gina K. Designs. This dog is so sweet and the little bird on his head looks totally at ease, don't ya' think? Again, the base is Mellow Moss, same DP, but this time I wanted to have a diamond shape on my card. I cut some black c/s into a diamond shape, added more DP, then stamped the image on white, sponged the edges with Brushed Corduroy Distress Ink and slapped it on. I used my sewing machine for the zig zag stitching and, ladies, I have to say, "I need more practice". I hardly use my sewing machine and it clearly shows. For the next little while, you may see stitching on my cards more frequently, plus, I'm going back to the book store to see if they have Sewing for Dummies! And, in case you didn't notice, the bobbin ran out of thread and rather than try to match us the stitches, I used a green marker to complete the last 3 or 4 stitches. It shows up like a sore thumb! BTW, when I colour in my images now, I only used Copic Ciao Markers. I love them. And, finally, the last card for this post is for Valentine's Day. The card base is Regal Rose and the DP is Making Memories - Lace Eyelet Edge (I wrote it down on a post-it note and stuck it inside the card, hehehehe). The image is by MissyB Designs, the Rag Dolls set. Again, you will note the stitching and, believe it or not, I wanted the straight stitching on the white c/s to be crooked. I had seen the effect on a card by Bad Sherry from Walkin' on the Bad Side and it looked great. Mine, not so great, but that's no surprise to me! The sentiment is from Gina K. Designs. I'm Canadian and must be bilingual, you know, so it worked perfectly. The addition of some Prima flowers, some pink velvet ribbon and a little bit of yellow satin ribbon and called it done. Okay, that's it for me. My fingers are worn to the bone from crafting and typing. I'll see you later. JessicaLynn Original stamps are in da house! The mail between the US and Canada over Christmas has been ridiculously slow, but finally, my Dragon stamps arrived the other day. Then, I had to wait to play because there were some errands that needed doing. (Does it never stop?) This morning, after posting the Bingo numbers (see post below if you're looking for them), I sat down and played for a bit. 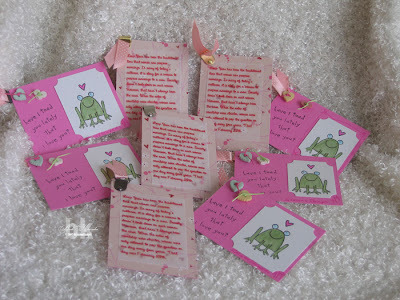 Here are my cards using JessicaLynn Original stamps. These cards are NOT a part of any sneak preview for the February 1st release of new stamps. They're just my playing around stuff. The dragon is, of course, the main reason I bought this set. He's such a cutie, don't you think? The cardstock is CTMH, but I don't know the specific green name. I used some paper I picked up at Michaels the other day. 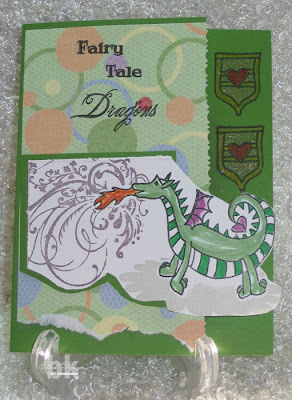 I have decided that paper with a Fairy Tale or Dragon theme is sparse. In fact, I couldn't find any that really grabbed me, so if you know of some, please leave me a comment and let me know what it's called and who makes it. I NEED some. I stamped Dudley (oh, I named him Dudley the Dragon) on PTI Select White using Palette Hybrid Black ink. I had dreamed about how to make some 'smoke' around the fire and I had a great swirly stamp by Inkadinkado which I bought for wedding invitations, of all things, and I thought it might just work. What do you think, does it work? Then, I coloured in the image with my Copic markers and my new Spica Glitter pens, also by Copic. They were used exclusively on the crests on the right hand side. Unfortunately, in the photo, the glitter doesn't show up very well, but it looks good IRL. The second card also used stamps from the same set. I tried some paper piecing on the flag and, although you can't really tell, under the Basic Grey border at the top, there is some pink mulberry paper with a fringed edge under the scalloped edge. It also looks better IRL. I added some Prima flowers, some dragonfly and butterfly brads, too. I did use my Nestabilities rectangle to emboss and cut out the pink bit of cardstock on which I stamped the scroll thingy. Sorry, English seems to be 'a second language' for me today! 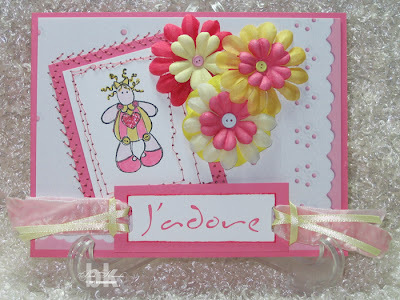 The card base is Blush Blossom by SU. That's it, but I'm working on another one, but had to stop to post these. Enjoy! I said I was going to stamp yesterday and I did. I just haven't downloaded the pics from the camera yet! 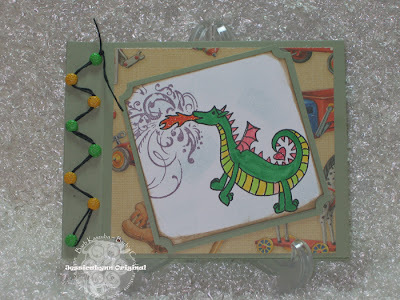 I seem to be working in baby-steps lately, but this afternoon I WILL post a pic of a card made with my new Dragon stamps from JessicaLynn Original. This is not a sneak peek, just a set I purchased because I fell in love with it. Okay, that's it for today. I'll be back later to post a pic. Once again, you have been busy and submitted cards for extra numbers. Thank you so much. I didn't get a chance to create anything yesterday because I had three appointments, but today is going to be my play day. Hopefully I'll have some pics for tomorrow's post as they always brighten up the blog. For now, I'll be content calling today's numbers. Are you ready? That's it for today. Keep those cards rollin' in because it all helps. Good Morning all, we have had plenty of submissions for today so I will be calling seven numbers. Just a reminder that we have ADDED Stamping Bella images, which means cards made with SU images are just fine, too! Okay, go mark your cards now and we'll see who's getting close! I'm going to try to make a Bella card today, but I've got a couple of appointments to attend, but I will if time permits. In the meantime, here's a picture of all my stamps. After I moved into the dining room area last week, I realized that I hadn't brought my stamps out yet. They were all in dresser drawers which meant that I had to find a new storage solution. I went to Staples and bought these stackable cases for about $8.00 each. 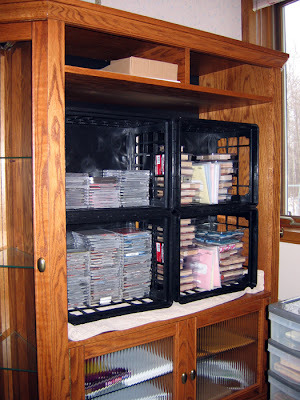 They work beautifully and will be part of a new storage system when we move. I can just keep adding to them, both upwards and sidways. The benefit of these cases, in my opinion, is that they are small enough that I can pick them up individually. Currently they are stored in an entertainment centre which once housed our TV, but since we bought a new TV that doesnt' fit into this unit, we're giving it to my brother when we move in the Spring/Summer. In the meantime, I've found a use for it, much to my DH's chagrin! As you can see, I have plenty of SU sets, tons of Bellas, PTI sets, Gina K. Designs sets, High Hopes and a plethora of other companies, as well. And, if you look closely at the SU case, you will see some CTMH sets stashed in there as well. There you have it, the evidence of my obsession. DH is still passed out on the floor after doing a mental tally of my investment in this "hobby"! See you tomorrow. Are you ready? Round 2 begins NOW! Okay, ladies, we're going for Round 2 right now. In order to win this round, you will need to get the letter T. Here's a couple of pics to show what I mean, after all, they say a picture is worth a thousand words. Before we begin, the challenge to use Stampin' Up images is now complete. 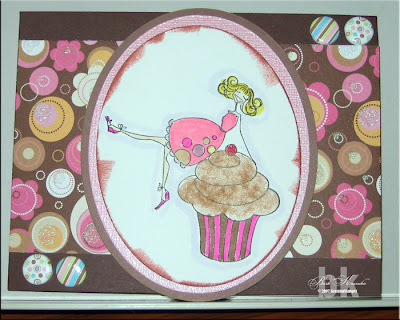 This time around, I'm going to ask for cards using images from Stamping Bella. You can use any sketch you want, any colour combo that pleases you and, you can make and enter as many as you want. It's only going to get harder from here on in to get to that BINGO, so stamp away! Now, today we have two numbers; the daily number and one from Alex, yesterday's winner. Alright, get busy making those cards. Have a great day and see you tomorrow. ETA: I'm beginning to see that not everybody is as crazy and obsessed as I am and buys every stamp in sight. 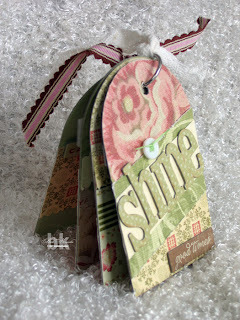 So just ADD Stamping Bella images to the mix. If you have one, great, if not, use any SU images you have. Next round, another company will be added and the same rule will apply, if you have it, use it, if not use what you have! We'll see how this goes, shall we? Congratulations, Alex! You have won Round 1 of Barb's Bingo. Your prize will be a $10 electronic gift certificate from JessicaLynn Original stamps. I just need to find out how to do it and it will be on it's way to you, via e-mail, I believe. You will love JessicaLynn's stamps and, the best part, there is currently a 35%-off sale going on right now. Watch your e-mail for the gift certificate. Let me just say that you ladies have been busy, busy, busy! I hope you don't wear yourselves out in the early rounds because I'm sure some of you will remember how long it took to get the "H" pattern last time. So, reserve some of that cardmaking energy for the upcoming rounds. Some players submitted more than one card (which is fantastic) and, in the interest of getting this posted quickly, I will link their blog only once (the last card entered) and you all can spend some time viewing the beautiful creations. Good Luck with all these numbers. Maybe today will be the day! I'm so sorry, but I've been under the weather the past 24 hours. I'm working on the post now, so check back in about a half-hour and the post should be here. There's a ton of numbers today and it should be exciting. Recipe Swaps are new to me! I think I've only participated in one other recipe swap, but I'm going to re-think this now. 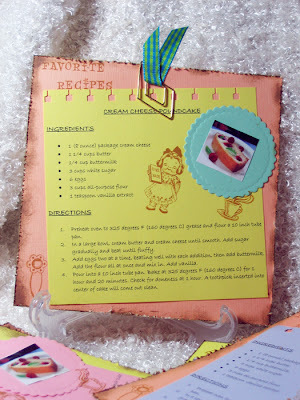 I joined a swap for Cream Cheese Recipes at The Stamp Shack and this is my recipe for a Cream Cheese Poundcake. It's being hosted by Christie and I have really enjoyed putting this together. 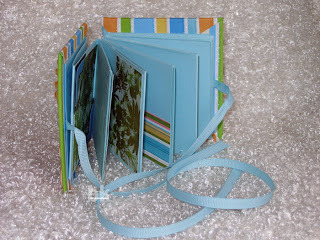 Plus, now that I've got a Bind-It-All arriving soon, I'll be able to make great recipe books for my family. The kids call frequently asking how do I make this or that. Yea, maybe a book of things I used to make that they really enjoyed will be just the perfect gift. Well, it's a very short post today. I'm off to do some grocery shopping in a little while and I always spend way too much money. I go for a few things and come home with bags and bags of groceries. I bet you all do, as well. I remember the days when going shopping on a Saturday afternoon, with all four children, was our weekly outing! That was fun, especially when there were free samples and they would eat them all up and then, with all the fresh groceries, I wouldn't have to make lunch that day. Well, that was a quick trip down Memory Lane. See you tomorrow. Last month or so, there was a plethora of blogs offering a Pay It Forward exchange whereby the first three people who left a comment on your blog would receive a handmade item. They, in turn, would post the same thing on their blog and on and on it would go. Well, I have finally gotten it together enough to make the little gifts and here is a sneak peak for you. The ladies in question have been notified that their gift is on its way and that it will be displayed here. When they get it they can compare the real life gift with the photo. Oh, BTW, only two people responded and that is why you will only see two gifts. For a closer look, just click on the pic. In addition to this, I have been moving my craft space for the past three days. I'm very slow at doing this kind of thing, but it needed to be done. Here are some pics for you. This pic shows an almost full view of my scrap space. It is formerly our dining room, but since we don't do much entertaining now, I decided to take it over. When the house goes up for sale, I'll pack it all away **boo hiss* and turn it back into a dining room. I needed the guest bedroom for DD when she comes up after I have my surgery. This is the view I have now when sitting and playing, er, I mean working. It overlooks the sunken living room. That stained glass window was specially made for a house we owned years ago, we just cart it around to each house and, fortunately, have always found a place for it. Hope that happens when we move into a condo later this year. 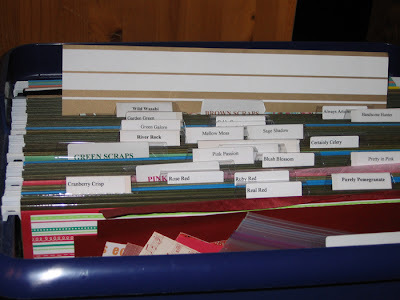 This pic shows how I've reorganized my cardstock. There are 2 buckets and each folder is labeled with the colour name, ie. Real Red, etc. I keep all the reds together, yellows together, etc. In front of each section is a folder labeled Red Scraps, Yellow Scraps, etc. This way, I have scraps, both patterned and plain, that match. I just thought of it and I think it's brilliant. I'm sure there are others who have the same idea, I'm just slower! And, I forgot to mention in the Bingo post below, that on weekends there are no new numbers called, so Bingo will resume on Monday. How's everyone doing? Any winner yet? Well, you ladies are contributing nicely, thank you. 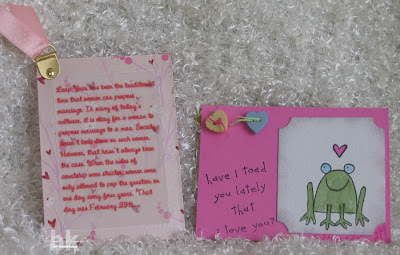 I did see one comment by Cathy and when I went to check out the card, it was made by Teri. I was not able to determine if Cathy made the card or not, but I do want to reiterate that the cards you submit must be made by you, the player. If I misunderstood Cathy's comment, please let me know and I will add the extra number to tomorrow's call. However, for today, we have three extra numbers. I am in the process of moving my stamp room from the spare bedroom to my dining room and I'm doing this for two reasons. First, I'm too cramped in the little corner of the bedroom. Either the guest bed had to go, or I had to move. Because my daughter, Tiffany, is coming for a two-week visit when I have my knee surgery (hopefully in February), she will need a place to sleep. Ergo, I'm moving to the dining room. We hardly ever use it because cooking and entertaining just isn't happening right now and, it's a much bigger space for me to s-p-r-e-a-ddddd out. The only downside is that DH will now see how much stuff I actually have. This isn't a good thing, believe me! I'll be back to stamping in a couple of days. I'm just taking it slow and easy. It won't take long to get a winner at this rate! Oh, ladies, I'm impressed. There have been nine, count 'em, nine, submissions for extra numbers for today's Bingo numbers. Grab your markers, 'cause here we go. WOW! Keep up the good work, ladies. Well, ladies, it's time to play. This is Round 1 and the first person to achieve one line, either up, down or diagonal will received a $10 Gift Certificate from Jessica Lynn Originals. In case you don't know, I was asked to be a part of Jessica Lynn's Design Team and I'm so excited. I thought I would take this opportunity to promote her stamps by offering a gift certificate from her shop. Good Luck to all. We start today with three numbers being called. See how easy it is to get extra numbers. Remember, for this round, any card, ATC, or altered item made with Stampin' Up images will be eligible for an extra number. Believe me, by the time we get to Round 3, you will want to be getting extra numbers! Here's my entry for an extra number tomorrow! I didn't want to call just one number tomorrow, so here's an ATC I made for a swap I'm in at The Stamp Shack. It's uses Stampin' Up images and is, therefore, eligible for an extra number for you players. Hopefully, someone will get an extra card or two by posting a comment here with a link to their card using Stampin' Up stamps. Okay, ladies, enter your cards here for the big start tomorrow!